Campbell joined the AU faculty in 1997, after some 20 years as a newspaper and wire service reporter—a career that took him on assignments across North America and to Europe, West Africa, and parts of Asia. He earned his Ph.D. in mass communication at the University of North Carolina at Chapel Hill in 1997, and has since written six books, including 1995: The Year the Future Began (2015), which revisits the watershed moments of a decisive time in recent American history. Campbell also has written two editions of the award-winning book, Getting It Wrong (2010, 2017), which takes on and debunks prominent media-driven myths. He also has written The Year That Defined American Journalism: 1897 and the Clash of Paradigms (2006), the first year-study in journalism research. 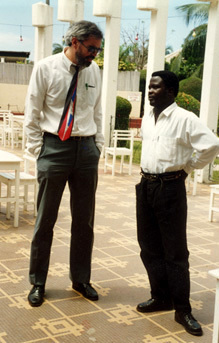 Campbell's first book, The Emergent Independent Press in Benin and Côte d'Ivoire : From Voice of State to Advocate of Democracy (1998), examined the wellsprings of independent-minded journalism in French-speaking West Africa (see photo of Campbell with a Beninese journalist, below). His second book, Yellow Journalism: Puncturing the Myths, Defining the Legacies (2001), challenged prominent myths of the yellow press period in the United States at the end of the nineteenth century. He also has written The Spanish-American War: American Wars and the Media in Primary Documents (2005). In addition, Campbell's work has been published in Journalism and Mass Communication Quarterly, American Journalism, Journalism History, Editor & Publisher, and American Journalism Review. 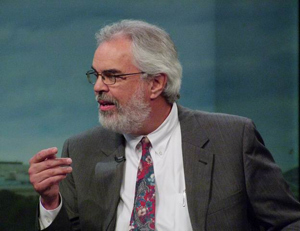 Campbell is the author of two blogs -- Media Myth Alert and The 1995 Blog -- and has lectured at the Library of Congress, the Smithsonian, the National Press Club, and the Newseum. He has delivered invited lectures at several major U.S. universities. His research has won awards from the Society of Professional Journalists, the Association for Education in Journalism and Mass Communication, and the American Journalism Historians Association. Campbell has been interviewed on many topics by a variety of news outlets, including the New York Times, Baltimore Sun, Washington Post, Philadelphia Inquirer, Politico, Chronicle of Higher Education, Editor & Publisher, Diane Rehm Show, C-SPAN2, and all local television stations in Washington, D.C. He is a past president of Kappa Tau Alpha, the honor society recognizing high academic achievement in journalism and mass communication studies. And he is a former chair of the History Division of the Association for Education in Journalism and Mass Communication. Campbell has taught 17 different courses in his years at American University, including: Decisive Moments in Communication, Foreign Policy and the Press, Advanced Reporting, In-Depth Reporting, Global Journalism, Contemporary Media in a Global Society, Censorship and Media, Understanding Media, and Sports Journalism. In 2004, Campbell established his faculty office in McDowell Hall, an undergraduate student residence hall on the north side of the American University campus. In 2005, he received the University's faculty award for service to the AU community. In 2006, he was chosen the AU student government’s "faculty member of the year." In 2007, he won the University’s Morton Bender Prize for promising associate professors. He was promoted to full professor in 2009. He also has won an American University award for teaching with research. Before entering journalism education, Campbell reported for the Cleveland (Ohio ) Plain Dealer, the Hartford (Connecticut) Courant, and for the Associated Press in West Africa and Europe. His international assignments included coverage of nuclear arms negotiations in Geneva, youth unrest in Swiss urban centers, the challenge to communist rule in Poland, political upheaval across West Africa, and the consequences of the world's deadliest industrial disaster at Bhopal, India. Campbell and his wife, Ann-Marie Regan, live in suburban Washington, D.C.